“Project Stork Inc. is a 501(c)3 non-profit corporation. We provide guidance, support, and resources for pregnant and/or parenting teenagers without judgement. We believe that investing in teen pregnancy prevention and services for young parents supports the development of healthy families and strengthens our surrounding communities. The formation of Project Stork Inc. is in response to Orleans and Genesee Counties disproportionately high teenage pregnancy rates. Our corporation helps teens (ages 15-21) navigate and balance pregnancy, parenting, education, and independence. Teenage parents need an avenue to empower themselves to succeed for both parent and child. Our programs encompass every phase with assistance, resources, initiatives, and support. This little shop offers a blend of new and old. They carry Infant, toddler, Preschool, and Maternity clothing. Over 1,000 excellent, pre-loved, name brand clothing items and 200+ boutique items, of trendy new fashions too! 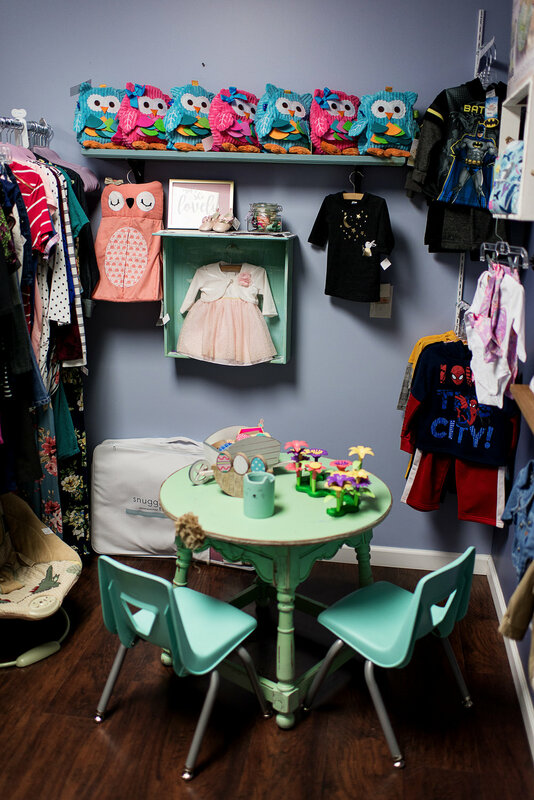 In addition to clothing items, they also have baby gear, manipulative toys, just plain cute stuff, maternity items, mom groups, toddler story time, and prenatal classes. Every Tuesday at 11:30 am and 6:30 pm she will hold FREE mini classes in the areas to meet moms and shop 10% off, Toddler Story Time, Breast feeding Q & A, and Newborn Care. If you would like to attend these events, please follow them on their Facebook Page to pre-register. In addition, her boutique is breastfeeding friendly, and includes a space for moms to feed and/or pump. Oh Baby Boutique is the FIRST recognized breastfeeding friendly shop in Genesee County, through the Orleans and Genesee Breastfeeding Coalition. They also provide a changing area for babies to be cleaned up, fully stocked with diapers and wipes. A small activity table is loaded to keep your little one engaged and entertained while you chat and shop! Have a look below to have a little sneak peak before her grand opening on April, 16th from 12pm-8pm!!! Marie Bohn is a family and baby photographer based in Batavia, N.Y. providing a custom portrait experience to families from Buffalo, N.Y. to Rochester, N.Y. and surrounding areas.